At the start of my second term, I set an ambitious goal for our city: to create 36,000 new units of housing by 2025. I said that to get there, we have to be bold - that we must challenge ourselves to think differently and craft programs and policies that address the housing needs of residents in every neighborhood and across the income spectrum. My Fiscal Year 2020 Budget does exactly that. With this budget, we're investing more in the tools we already have. Coming into office, I doubled the District's annual investment in the Housing Production Trust Fund (HPTF) from $50 million to $100 million - more per capita than any other jurisdiction in the nation. Approximately 90 percent of recent HPTF funds have gone to households with an annual income of no more than $59,000. This year, I'm increasing our Housing Production Trust Fund investment by 30 percent to $130 million. We're also increasing our investment in the Housing Preservation Fund from $10 million to $15 million. But that's not all we're doing to keep housing in DC affordable for more Washingtonians. We've also created a new tool: the Workforce Housing Fund. With the Workforce Housing Fund, we can create and preserve housing for teachers, first responders, construction workers, social workers, and others—those who have a good-paying job but also need a good, affordable home in our city. Because these have been and continue to be very good times for DC, we are in a position where we can invest more and do more. We know that keeping DC affordable for residents and families is a top priority for Washingtonians across all eight wards; this budget makes clear: it's my priority, too. Learn more about the new Workforce Housing Fund HERE. 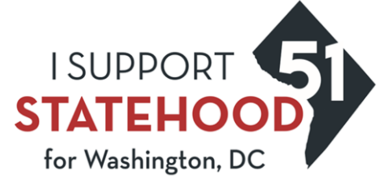 Join the Washington, DC Statehood Office for a DC Statehood Phone Bank. We are calling state legislatures across the United States to raise awareness about DC's lack of voting representation in Congress. All phone banks will take place from 10:00 a.m. to 6:00 p.m. at the John A. Wilson Building (1350 Pennsylvania Avenue, NW) in Room G-9. Phones, scripts, materials, and light refreshments will be provided. Learn more about upcoming opportunities HERE. With Earth Day less than a month away, the Bowser Administration calls on DC residents to help keep our city clean! 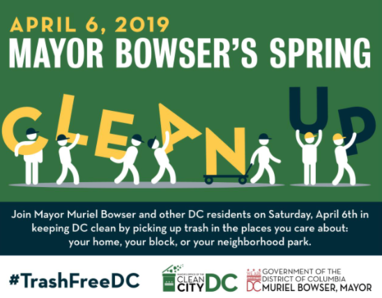 On April 6, join us in taking five minutes to clean up outside your home, 30 minutes along your block, or team up with others for a full neighborhood scrub. Residents can also join larger cleanup events hosted by the Mayor's Office of Community Relations and Services, the Office of Neighborhood Safety and Engagement, and others. Take the Clean City Pledge HERE and tell us how you plan to show your DC love on April 6. The Bowser Administration and the Office of the Chief Technology Officer (OCTO) will host the first All Hands On Tech of 2019 on Saturday, March 30 from 10:30 a.m. until 3:00 p.m at the Shepherd Park Neighborhood Library in Ward 4. This initiative is run by OCTO and the Connect.DC program to provided District residents with free technical support, including laptop repairs, virus assistance, and smartphone troubleshooting. A Spanish translator will be available at each event. Interested residents can text FIXED to 83224 or visit connect.dc.gov to preregister and to get details. For more information, please contact Connect.DC's Resident Engagement Specialist Akilah Everett at akilah.everett@dc.gov or (202) 741-8835. This week’s District Minute features stories about the modernized Capitol View Library, the start of Potholepalooza, and the District's fifth annual March Madness event. The District Department of Transportation (DDOT) is the District agency that manages and maintains transportation infrastructure in Washington, DC. DDOT's mission is to enhance the quality of life for District residents and visitors by ensuring that people, goods, and information move efficiently and safely with minimal adverse impact on residents and the environment. 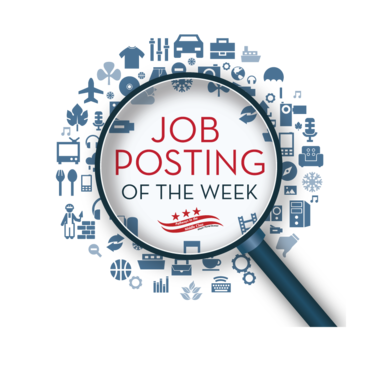 DDOT has an opening for a Street Sign Installer. This position is responsible for performing a variety of tasks, including the installation of U-posts. All details regarding this vacancy, including qualifications, can be found by visiting the job announcement.